You are a Greek Hoplite warrior charged with the task of retrieving the Golden Fleece. Along the way you will encounter monsters and shrines of the gods that will grant upgrades and healing. Obtaining The Fleece is difficult enough, but you can choose to continue into the depths to challenge your previous high score. In the true rogue-like fashion, each attempt at The Fleece is unique. Your character's upgrades and abilities are reset and the upgrade options available to you are slightly randomized. There is no time limit, but each floor down gets increasingly difficult. At first glance, Hoplite appears very simple. 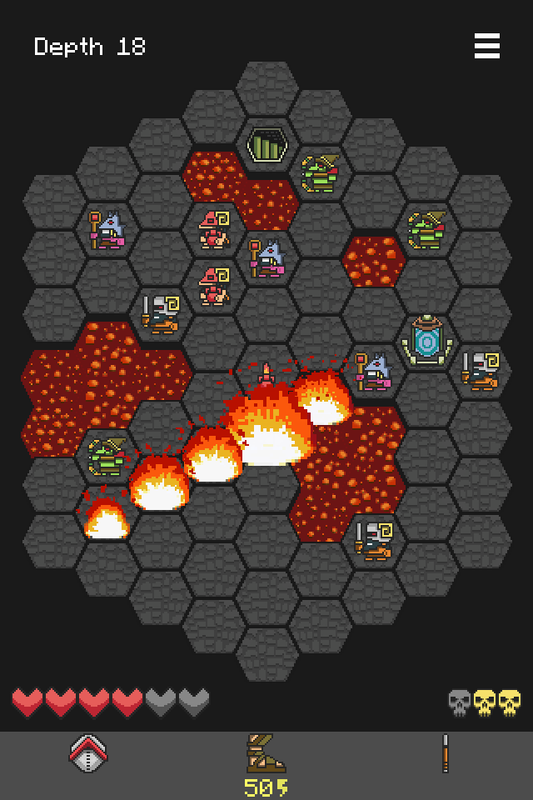 You appear on a hex grid with two tile types: stone and lava. There are "walls" on the outside, but you can't really see them. They have no graphics, but they come into play later on. For each move you have a few options: move, leap, shield bash, or throw your spear. Oddly enough, the ability to attack is something of a byproduct of those decisions. Depending on the location of your enemies in relation to your current and ending position, you may attack zero to many enemies. This can be difficult to understand at first. I made a lot of poor decisions thinking I'd attack adjacent baddies, only to be pummeled to death instead. There are a few options available to you that may make that easier to understand. One is called Fat Finger Mode that basically adds a second click to confirm your decision. The other is called Swipe to Move that changes the movement behavior to a swipe instead of a destination tap. It draws a directional line that I felt gave me a lot more control. After that, my play experience became faster and more accurate. I don't use the Fat Finger Mode though as it seemed unnecessary with the Swipe to Move option on. There are a finite number of ability upgrades, but because they begin to form a skill tree of sorts. I found myself spending most of my later gameplay tinkering with different skill combinations to see what worked best together. Improving my shield bash because I was getting mobbed by baddies later on or increasing my jump distance so I could simply leap out of the way of battle. There was no way to tell which strategy would work better than the other until you got to the lower levels and if you weren't paying attention you might not get there on the first few tries. The bad guys are also more complex than they seem. The warriors are pretty basic units who move in to attack. The bombers keep their distance to toss bombs at you. And the archers and warriors attempt line of sight. That sounds pretty straight forward, but as you get to deeper floors, I noticed the same unit types starting to work together with more complex maneuvers to try and trap me into a "pick your poison" situation. They don't get really tricky until you get pretty close to The Fleece but it was a pleasant surprise. I definitely thought I was trapped a number of times and walked away pretty proud of the tricks I used to get out of it. If normal questing ever becomes boring, you also have the opportunity to enter challenge mode that sets up super complex baddie scenarios with randomized perks you just have to deal with. I never really messed with that too much. There are a lot of achievements in the game, and I think I may have got a half dozen of them but despite having never played the challenge modes, I put enough hours into this game to earn the critical eye of my girlfriend. This sounds really silly but one of my favorite aspects of the game is the option to choose a Legacy Graphics option as seen above. I found it way easier to quickly scan the board to identify enemies and develop a strategy. Or maybe I just have a real soft spot for an artist that can accurately represent a unique character type in a 10x10 pixel square. That sort of minimalism is a real skill. Summary: The game comes in kind of high on the price range for iOS games at $5 USD, but it's totally worth it. It's absolutely the title that got me playing games on my phone again and really began exploring the rogue-like space on iOS. This was definitely the first game I started playing that earned the girlfriend comment of "you're always playing that game."